Createspace Independent Publishing Platform, 9781537410913, 300pp. 'A warm summer breeze lifts pale blue sheets and a host of marshmallow clouds float over my balcony.' The Ghosts of Italy is Angela Paolantonio's memoir of how she first discovers and then returns to live in the remote mountain village in Southern Italy where her grandparents were born. She sets out late one November, just after having celebrated Thanksgiving alone on a rooftop in Rome, the spirit of her ancestors guiding her in. "I really didn't know I was searching for anything till I got here," she says. "Then I realized what I was missing and what it meant." Angela Paolantonio's archetypal journey to the village of the ghosts of her ancestors is a unique yet universal woman's story. She ventures across the threshold of a lost world, reclaims it, and falls deeply in love along the way - with the town and its residents, the landscape, and the Handsome Man from Macchiursi. She follows the clues to rediscover her spirit and the spirit of her grandmother, and namesake, whose memory had been lost to her, locked inside her father's heart. The Ghosts of Italy opens with Angela's daydream of one day owning a stone house on an Italian hillside, sheep grazing below her balcony. 'Now I have them in view.' Then wistfully, 'But it's not just any view. It's the balcony view of my grandmother's youth.' With good timing, Angela ends up buying the very house where her grandmother was born, made of fieldstone set by hand by her great-grandfather, with the beautiful view, kept in the family for generations. But will she trade a career in Los Angeles to live the Roseto Mystery? Angela Paolantonio, whose grandparents landed at Ellis Island, was born in Brooklyn and raised on Long Island. Her love of photography began as she watched her father expose and develop contact sheets on the family kitchen table. She holds a Bachelor of Fine Arts and Art History degree from Long Island University, Southampton, New York. She is a writer and photographer, curator, and consultant for art and photography exhibits, books, and events, both in Italy and the U.S. Angela lives in Calitri, Italy, on via Fontana, in the house where her grandmother was born. Angela Paolantonio's lyrical journey into the land of her ancestors evokes all that we love about Italy: the intimacy of its people, the beauty of its landscape, the soul-nourishing food and the embrace of family. 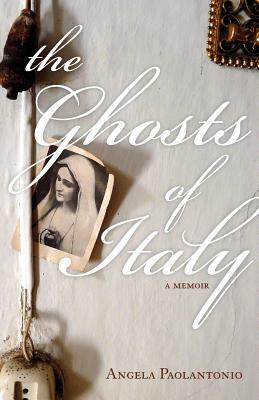 Ghosts of Italy brings all this to the page in vivid detail sprinkled with serendipity. Maryann Calendrille | Owner, Canio's Books, Sag Harbor, N.Y.
"I found the read captivating. I could relate to the whole being single in Italy, as Italians in general simply don't understand about being a single, independent woman. I don't know that I have ever been somewhere where I felt I belonged and there were spirits from the past watching over me and guiding me. What an extraordinary experience."